La Digue is the fourth largest island of the Seychelles and together with Praslin if is one of the most popular and beautiful islands of the archipelago. La Digue is also home to the famous Anse Source d'Argent, the picture perfect image of emerald waters, white palm fringed beaches and the very special round granite rocks. As it is the least developed of the main islands, it is probably the best to get away from it all without paying very high prices and maybe a place you want to stay much longer than you planned. Veuve Nature Reserve, in the island's interior, is home to the rare black paradise flycatcher, of which there are only about 100 in existence. La Digue's tallest peak, Belle Vue (Eagle's Nest Mountain), is in the central part of the island, with a summit more than 300 metres above sea level. La Digue is also visited for its wide variety of underwater creatures like fish, sharks and rays. The island has plenty of accommodation and activities to offer tourists. There are at least twenty guesthouses and hotels, a few restaurants and a dive centre. 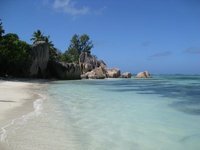 One can go on a boat trip or a diving trip around La Digue for one day or half a day. Furthermore, the Veuve reserve offers tourists a hiking trip with a guide who can show them the beauty of La Digue. La Digue has a warm and humid climate but as the distance to the sea is never more than a few kilometers in most places, there usually is nice and cool breeze during most of the year. Temperatures are around 30 °C during the day and still above 20 °C at night most of the year. The best time to visit La Digue is during the southeast monsoon season which lasts from late May to September when both temperatures and rainfall are lowest. The warmer and wetter season is during the northwest monsoon which lasts from March to half May. #There is a helipad served by Helicopter Seychelles. There are around 5 round trips daily between Praslin and La Digue by ferry, taking around 30 minutes and the schedule is timed to interconnect with the Mahé to Praslin service. Due to its small size, La Digue has little need for the transportation infrastructure seen in Mahe or even Pralin. There are only a handful of taxis for hire on the island, and no car rental agencies. As a result of the low supply, prices for taxi are high - approximately 90 Euro for a half day or 30 Euro for a trip to the beach. If you are staying at one of the resorts on the island, your hotel will likely arrange for ferry pick up, but check before hand to ensure you are not stranded. For those arriving by ferry for a day trip, you will see many companies offering bikes for rent. This is really the only way to travel around the island, and quite affordable at about 8 euro for a whole day, just make sure you test your bike before you take it. If you aren't going very far, there are also ox carts (a buggy pulled by an ox) that you can catch a ride on. There are several Creole take-away restaurants available in town offering curry, fish, pork, and rice dishes. For the more picky eaters there is a very overpriced resort style restaurant offering more western familiar foods, as well as seafood. There is also a small gelato shop (ice cream) just south of town on the main road. You can also go to a restaurant in advance and ask the chef to prepare a special meal for you. There are many grocery shops around where you can buy ready to eat food. Beer is readily available in La Digue and can be bought in various shops. Mineral water, cold drinks, etc are also available. Being that the island is very small, very few people stay over night. However if you choose too, or if you miss the last ferry at 5:00pm, there are just a few very expensive hotels in town. its a much better option to just plan on a day trip to the island, which is plenty of time to see all of the sites. This is version 5. Last edited at 8:55 on May 2, 17 by Utrecht. 5 articles link to this page.